Make your diamond drilling easy with one of the most trusted diamond core drills. The DMS240 is a concrete hole saw with electric drill motor and stand. It is suitable for many core drilling applications and is the most powerful system in Husqvarna’s core drill and stand range. This is the perfect diamond drilling system for medium core drilling in walls, floors and roofs up to 250 mm diameter. The simple tilting stand and its back support feature makes the job easier and ensures you get reliable and stable angle drilling. This core drilling system can be used for drilling ventilation and plumbing channels, waste evacuation pipes as well as barrier and road signs. 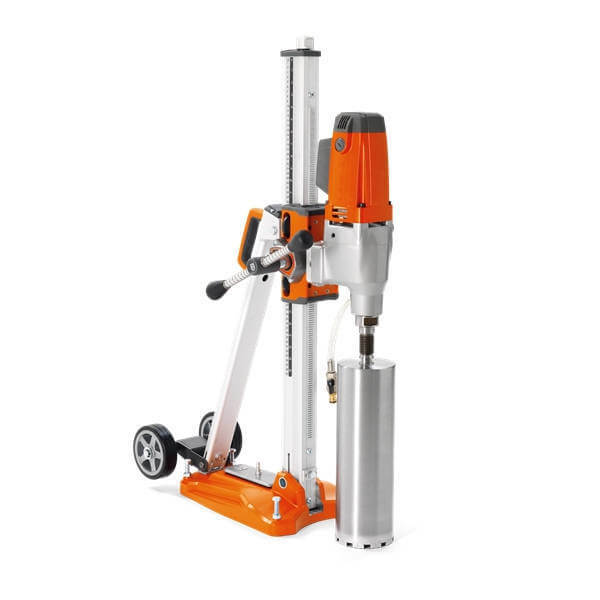 This concrete drilling system is easy to set up and has an integrated vacuum base which means that you don’t need to clamp or anchor it down. As it is lightweight and compact, it is easy to transport this core drill system from one work site to another. Tilting angle of the stand: 0 to 45 degrees for angle drilling. Drill holes up to 10″ (153mm) in diameter. CDBS Construction Centre also stocks hard wearing diamond cutting bits. If you are after a package deal, let us know which core drill machine and core drill bits you need. Did you know that we do national delivery around Australia? We know that you could be earning money instead of driving around shopping for tools. To make it easy for you, we offer home and work site delivery options!